Looking for something for the dog lover in your life? 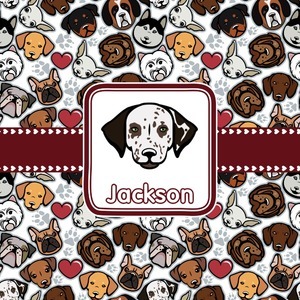 Why not this adorable design with dog faces and a few dog paws thrown in is perfect for dog lovers! Dogs include chihuahua, dalmatian, husky, pug, terrier, boxer, rottweiler, beagle, bulldog, dachshund, labrador and mastiff. We chose a maroon ribbon with hearts and a square label. We chose the graphic and text for the label contents and featured the dalmatian face along with a name to personalized it.